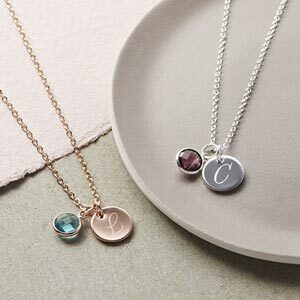 The Personalised hammered Initial disc necklace is a beautiful modern double disc pendant necklace presented in a personalised luxury ribbon gift box. The personalised hammered double initial disc necklace is stunning modern discs in silver and rose gold with letters of your choice. Why not add extra discs or a Swarovski birthstone charm in silver or rose gold to make your necklace extra special. This beautiful necklace is available in silver or rose gold and includes a handstamp initial. 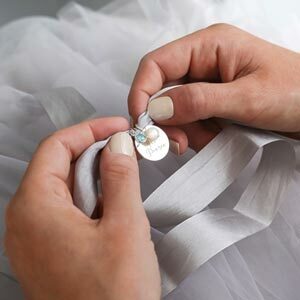 Silver or rose gold swarovski birthstones can be added to create a stunning necklace. The chain was too short given the size of the neck it was to go round. I asked if there was an extension chain available, and they told me that it was already affixed. But it still wasn't long enough. Also that pendants were much smaller than I imagined. Lovely necklaces exactly what I was looking for. Mother in law delighted with present. I have bought 5 of these in total on separate occasions. The quality is fantastic and presentation of the perfect way to deliver a special touch to someone you love.